Stuffing them! There’s nothing better than a firm, buttery avocado filled with delicious meat and garnished with something special. It’s like the giant seed in the middle that leaves a big well in the meat of the avocado is nature’s way of telling us to stuff it. Literally. And the best part is you get to eat the whole half (or two) without feeling greedy! This recipe is super simple. This recipe is super simple. You can use taco meat instead of chorizo if you like. I prefer chorizo because the spice is already embedded in the meat. 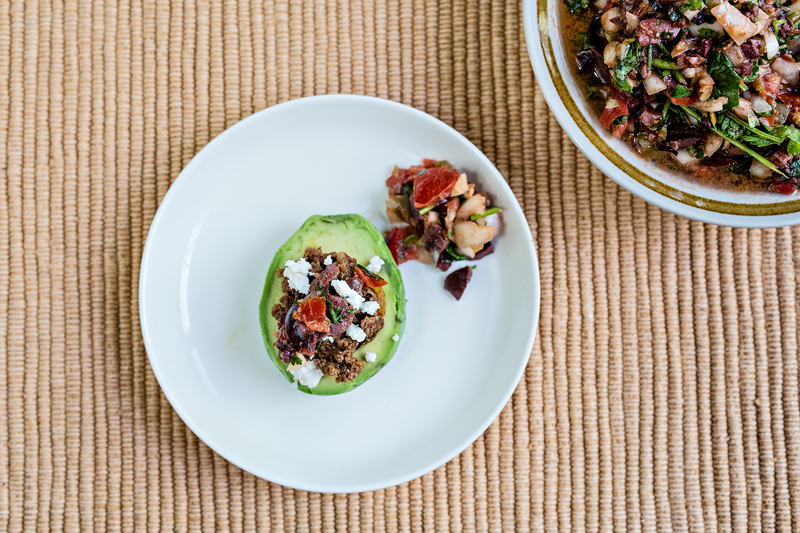 Simply sauté up an onion, brown the meat and pile onto half of a peeled avocado! I opted for an olive pico to go with this because the tang of the olives cuts through the heavy spice of chorizo very nicely for a sort of “Spanishexican” fusion. Combine all the ingredients and set aside. Alternatively, you can put roughly chopped ingredients into a salsa maker and give it a whirl. Heat a skillet over medium-high heat. Add the oil and diced onion and sauté until soft, about 5 minutes. Add the chorizo and cook until completely browned about 5-10 minutes. Set aside to cool slightly. While the chorizo is cooking, half, de-pit and peel the avocados. Once the meat is done, fill the well where the pit was with the meat. Garnish with olive pico and chorizo.